The findings of a recent Harvard study suggests men who are part of a couple undergoing treatment for infertility may fare better if they hold off on the bacon, sausage, and other processed meats until after IVF success progresses to a confirmed pregnancy. That suggestion doesn’t mean leaving an empty spot on the dinner plate, though. Seems men who regularly consume poultry (chicken, turkey, duck, and such) exhibited a higher rate of fertilization than those who consumed less poultry. These meaty recommendations may be particularly beneficial to couples trying to conceive by intracytoplasmic sperm injection (ICSI), a form of in vitro fertilization (IVF) often preferred when male infertility makes conception difficult. Dr. Wei Xia led the team of researchers who explored the connection between IVF success and men’s meat consumption. Xia is a visiting scientist working at the Harvard University T.H. Chan School of Public Health’s Department of Nutrition in Boston. He and his research team followed 141 men who, with their female partners, were undergoing IVF treatment at Massachusetts General Hospital. The 141 couples in the Harvard study underwent a total of 246 assisted reproductive technology (ART) cycles between 2007 and 2014. During their time of treatment, the men responded to dietary questionnaires designed to identify each man’s meat consumption during the course of treatment. The research revealed dietary links that varied by type of meat consumed and type of ART. 28% higher fertilization rate in men who ate no more than 1.5 servings of processed meat a week than men who ate 4.3 servings or more a week. The higher fertilization rate was most significant when ICSI was performed. 13% higher rate of fertilization for men who ate the most poultry than men who ate the least amount of poultry. The higher fertilization rate did not vary between men using ICSI or conventional IVF therapies. It is important to note this study explored fertilization rate alone. It did not address implantation, clinical pregnancy, or live-birth rates. 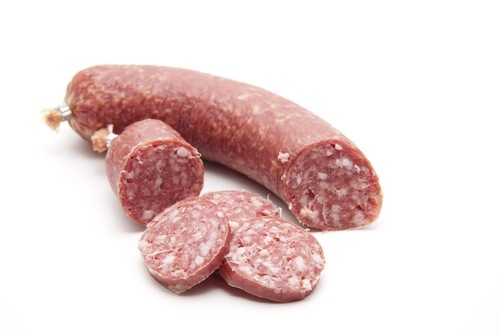 Processed meats are often referred to as charcuterie, the age-old process of using salt, sugar, smoke, spices, and other processes to preserve meat. Bacon and sausage are two of the most common forms of processed meats eaten in the US today but hot dogs, salami, pepperoni and most other pizza-topping meats, deli meats and cold cuts, canned meats and meat products, jerky, chorizo, smoked meats of all kinds, lox and other smoked fish, holiday hams, and chicken nuggets are all forms of processed meats, too. Multiple studies in recent years have documented negative health effects, such as cancer, cardiovascular diseases, obesity, and diabetes, when processed meats are consumed on a regular basis. Xia, Wei, et al. "Men's meat intake and treatment outcomes among couples undergoing assisted reproduction." Fertility and Sterility 100.3 (2015). Web. 14 Aug. 2015. "Categories of Processed Meat Products." FAO / Food and Agriculture Organization of the United Nations. FAO, n.d. Web. 14 Aug. 2015.